Be careful where you dig. Most yards nowadays have buried cables and lines that run to your house. So be cautious when digging so you don’t end up without internet for a few days. Find a suitable tree for your area. Different trees grow better in different regions. For instance, peach trees thrive in the Georgia soil and climate. Do a little research before planting something that may not do well in your region. Select a good location. Remember, this tree will grow. Take that into account when choosing a spot. 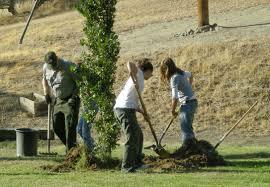 Plant away from your house and power lines, the tree should be able to grow unobstructed. Dig a hole 4-5 times the width of the root ball. Big enough to work with. Roots need broken up soil to spread. The point where tree comes out of the ground should be slightly higher (1/4 to a 1/2 inch) than the rest to avoid over watering. If the soil you are using is not rich, mix some compost in when filling the hole. Use stakes if necessary for the first year or so. Pat yourself on the back, you just added that much more oxygen and greenery to the world!